Last month I attended Kansas City Mo Public Library exhibit of Our People, Our Land, Our Images. It was there that I saw the plaque on the wall referencing the Cherokee Female Seminary graduating class of 1902. An accompanying photo was provided by Jennie Ross Cobb (Cherokee). As family researchers we are always looking for early Native American Ancestors, especially women, and I found the history of the Cherokee Female Seminary to be helpful for a recent project. Of course female seminaries were as popular as boarding schools by the 19th century and many have preserved genealogy-filled records. On 7 May 1851 the Cherokee Nation opened the female Seminary in Park Hill Mission (OK), making it “among the first educational systems built west of the Mississippi-Indian or non-Indian. In fact, for a period of time during the mid-nineteenth century, the Cherokee population was more literate than the neighboring non-Indian population” according to Wilma Mankiller, the first female Cherokee Nation chief. From 1851 to the close of the American Civil War the school was in operation. During the Civil war the seminary was used as a warehouse, hospital, etc and it took until 1870 to ready the seminary once again to accept students. Then after Oklahoma statehood, the land and building was purchased for forty thousand dollars to be converted to the Northeastern Normal School. The seminary was modeled after the Mount Holyoke Seminary in Worcester MA and was established by the Cherokee Nation, not the Federal Government or Missionaries. Not only was the Mt. Holyoke Seminary curriculum adopted, many of the teachers were graduates from Mt. Holyoke Seminary; others were from Yale and Newton Theological Seminary. Free tours of Seminary Hall are offered by the Cherokee Nation , but keep in mind this is not the original structure of Park Hill Mission, as it was destroyed by fire in 1887. Please note there was also a Male Seminary. It too was burnt down in 1910, but was never reconstructed. 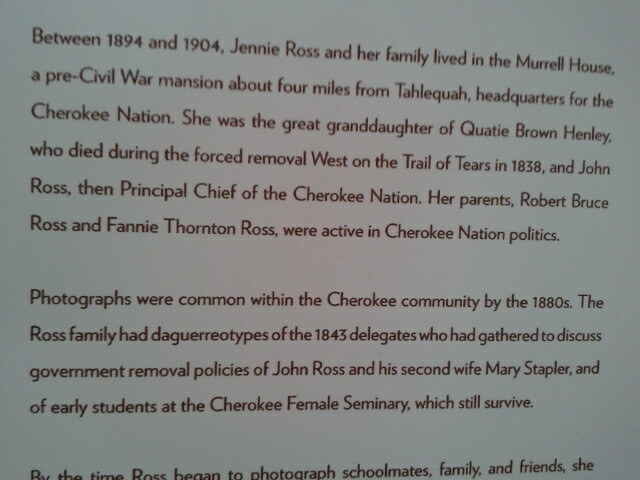 However, through biographies and obituaries, you may find more information on your Cherokee ancestor. 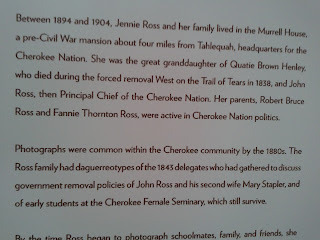 The Cherokee Nation site even mentions a few who attended like Dr. C. M. Ross. Hew was the Medical Superintendent, was born in Tahlequah, Cherokee Nation, December 17, 1868. He is the grandson of the chief, John Ross. He was educated at the Cherokee Male Seminary from which institution he was graduated in 1887. It is said that students, elementary from high school, were “acculturated Cherokees, many of them already familiar with “White ways,” the majority being mixed blood Cherokees. According to the Mt. Holyoke records, full and mixed blood Cherokees were eligible to attend, but the school did not offer courses in Cherokee language, history, or culture. Acculturation and assimilation into the “white” society was ideal. Out of the 3000 girls who attended the Seminary only 212 graduated; the last graduating class being 1910. The best place to being this research is at the Oklahoma Historical Society website. Here the researcher can locate school records from 1874-1909, photos as early as 1860 and original manuscripts. .
Elzie Ronald Caywood, "The History of Northeastern State College" M.A. thesis, University of Oklahoma, 1950. Brad Agnew, "Legacy of Education: The History of the Cherokee Seminaries," The Chronicles of Oklahoma 63 (Summer 1985). Ellen Goodale, Ellen Rebecca (Whitmore), Journal of Ellen Whitmore, ed. Lola Garrett Bowers and Kathleen Garrett (Tahlequah, Okla., Northeastern State College, 1953).